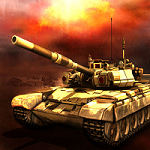 Tanks Battle Desert excels on sophisticated AI for you to play against! You start by selecting different tanks with different criteria and weapons, then assign a role for each tank to do during the battle. After that, you're ready for the big battle on desert with the powerful AI. So, try your best to win and every score matters! Enjoy the battle and beat your opponent!